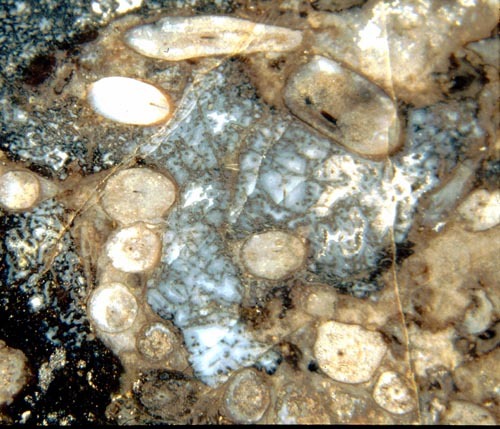 Silicification was so rapid at the Lower Devonian Rhynie chert location that even quickly decaying structures like fungus hyphae were preserved in large quantities (Fig.1), which is exceptional among fossil-bearing sites. In order to judge the significance of fungi for early terrestrial ecosystems one should be able to distinguish and classify them. This is virtually impossible with hyphae alone. Information on details beyond the plain hyphae is often not available so that there are probably more species present in the chert than have been firmly established as such [1,2,3]. Any fungus-related structure with distinct features, as the one in Fig. 2, is worth being noticed. Fig.1: Hyphae of some aquatic fungus grown during an early stage of silicification in a water-filled cavity which had been a gas bubble between Rhynia shoots upset and inundated by flooding. 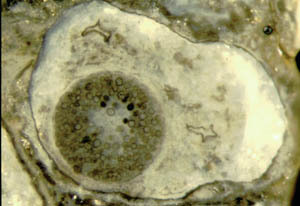 Fig.2: Fungus chlamydospore, diameter 0.5mm, with small chlamydospores of an intrusive fungus inside, 20-35µm, within decayed Rhynia; same sample as Fig.1. An object of same size and similar aspect as the one in Fig.2 had been observed by Kidston and Lang  and interpreted as two fungi in one: a big "resting-spore" (now usually called chlamydospore) of the fungus Palaeomyces gordonii var. major filled with small chlamydospores of an unnamed intrusive fungus, denoted there as Fungus No.14. "Chlamydospore" is one of the not so well defined terms in mycology, denoting usually thick-walled enclosures which a fungus may occasionally bring forth, with the dual purpose of standing harsh conditions and providing a way of asexual propagation. The big type of chlamydospore filled with small ones is one of the rarer sights in the chert. There seems to be no easy way to find out if the chlamydospores in Fig.2 are related to the hyphae in Fig.1. It is worth mentioning that there is an unexpectedly close relation between the most abundant and thoroughly investigated fungus in the Rhynie chert, Glomites rhyniensis , and extant Glomus species, which are well-known for their arbuscular mycorrhizae. in: Microbial Endophytes, eds: Ch.W. Bacon, J.F. White Jr., New York 2000. Trans. Roy. Soc. Edinburgh, Earth Sci. 94 (2004 for 2003), 457-73. Grondboor & Hamer 58(2004), 33-50. Part V, Trans. Roy. Soc. Edinburgh 52 (1921), 855-902.